Safety planning that started before the project began becomes increasingly important as the house rises out of the ground. Limited floor area, sloping surfaces, and overhead work combine with the height of the upper floors and roof framing to make fall protection, setbacks, work zones, and barricades especially important. 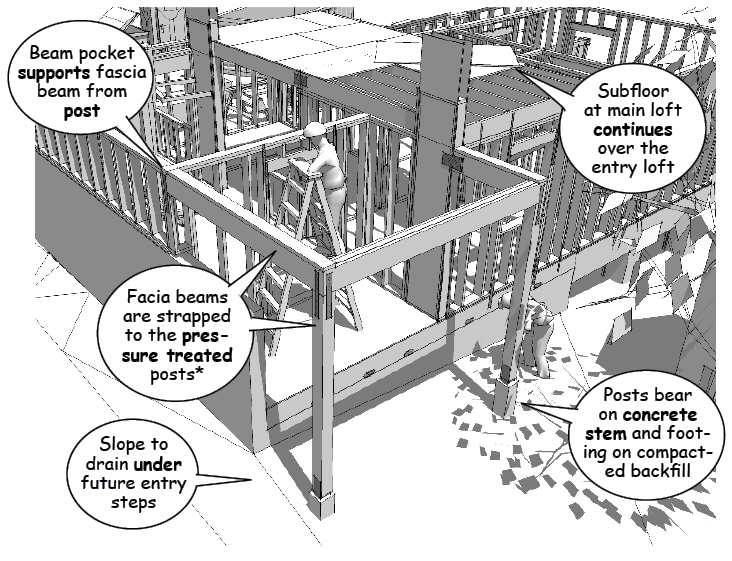 To minimize possible injury, lead carpenters coordinate cutting and framing activities, monitoring the use of saws, nail guns, hoists, ladders, and scaffolding for both the main and upper work areas. For this reason, whenever possible, rim and floor joists are installed from step ladders or rolling scaffolding to reduce the possibility of falling tools, materials, or workers. 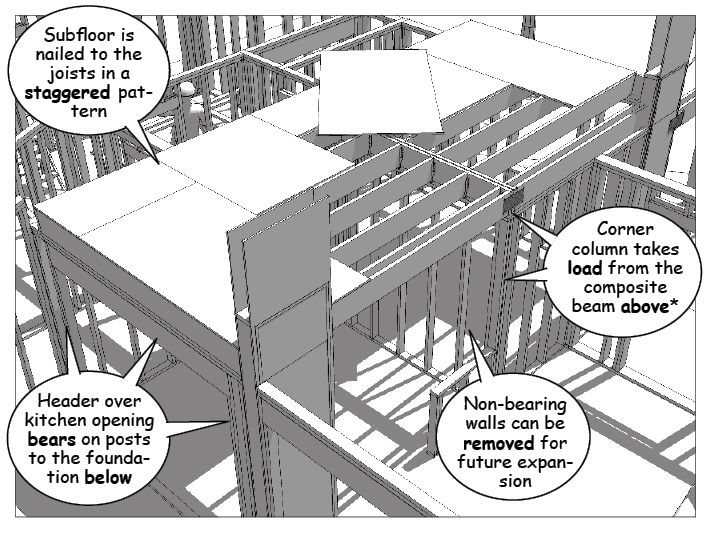 Headers and beams bear on the double top plates of the main floor wall framing and the embedded columns. Once in place, they are secured with clips, straps, or fasteners at the beam pockets, following engineering specifications and local building codes. 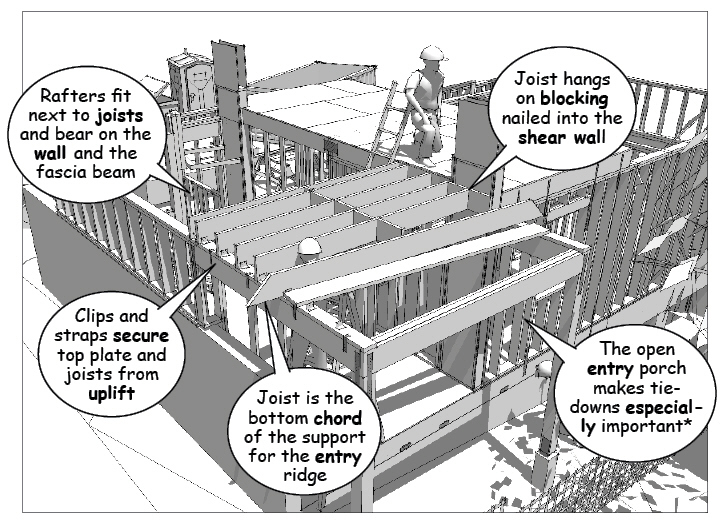 Sheathing for the shear walls is nailed continuously across the upper floor framing to maintain lateral resistance within the structural frame. The upper floor joists are then placed to “sandwich” the vertical shear wall into the floor framing before the subfloor is installed. Structural connections require special attention when freestanding roofs extend over open areas beyond the plane of exterior shear walls. For example, in this tutorial the entry roof is open on three sides and exposed to lateral and uplift loads. This leaves the framing vulnerable to the environment, loads from wind, earthquake, rain, snow and insect damage. This exposure also makes it important to install the framing members using tie down straps, as well as post footings with base brackets that compensate for uplift and moisture penetration. Engineered structural connectors are again required by building codes in most jurisdictions (See Simpson Strongtie). Before the sheathing is finalized, carpenters add blocking between the floor joists to stiffen the frame at center span and bearing positions. 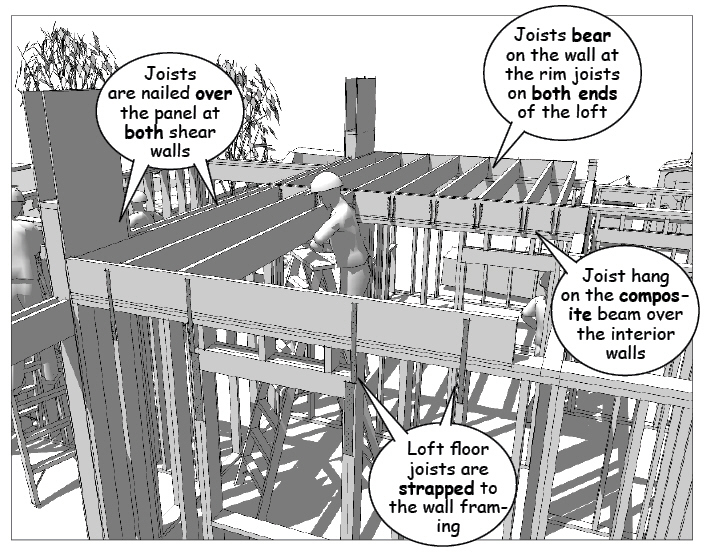 Solid blocking is installed at post or column bearing points to carry loads through the upper floor framing to the foundation or girder beam below.